To date, a number of researchers have put forward that isoprene may be used as a marker in human breath for blood cholesterol. These researchers have theorized that using isoprene as a non-invasive technique could be an effective diagnostic tool to assess changes in blood cholesterol levels in individuals. During exercise, isoprene is washed from the participant’s muscles and exhaled. The suspected mechanism for this is thought to be via the pulmonary gas exchange process. This is made apparent by an initial rise in expired concentration, followed by a decrease and plateau. The HPR-20 Transient MS was used and proved to be ideal due to its fast response, wide dynamic range and high sensitivity offered by the PIC detector. It was coupled with a proprietary breathing mask that was modified to accept a heated Quartz Inlet Capillary (QIC). Subjects of various ages and fitness levels were set a test that wouldn’t maximize their exertion. They were allowed to control the resistance and their own perceived rate of exertion controlled the effort level. The test itself comprised of a minute at rest, followed by 5 minutes of gentle exercise on a stationary bicycle, and then a further 5 minutes rest. As the graph shows, the initial level of isoprene was ~50 ppbv. The initial ‘washing out’ of the isoprene from the muscles to the blood stream is evident in figure 1, approximately 200 ppbv. This is then followed by a decrease to a baseline value that is below the initial level, implying that the levels of isoprene in the blood did not rise back to the level seen during the first rest period. After another hour of rest it returned to the starting level. Figure 1. 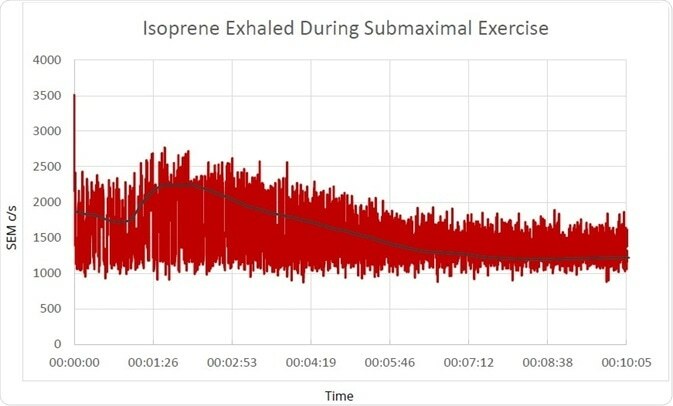 Trend data showing the change in isoprene concentration in expired breath during a submaximal exercise test. Figure 2 shows the rapid response times of the HPR-20 Transient MS allowing for each breath to be viewed. From this, end tidal, as well as breathing rate, could be deduced. Traditional online measurements cannot offer this level of insight, so there is an excellent improvement there. Figure 2. MASsoft v7 Data showing breath by breath isoprene levels during an exercise test. Real time analysis of exhaled isoprene is proven to be viable. 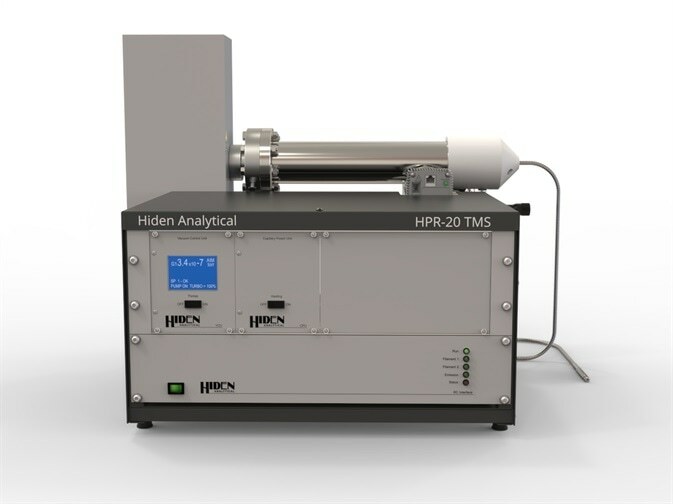 The Hiden HPR-20 TMS is proven to be the ideal product for high speed, high sensitivity analysis of compounds in human breath. Hiden Analytical was founded in 1981 and is presently situated in a 2,130m2 manufacturing plant in Warrington, England with a staff of over 50. As a privately owned company, our reputation is built on creating close and positive relationships with their clients. Hiden Analytical is committed to providing systems which meet specifications of both new and existing clients, but further, enable the advancement of their work, whether it be pure research or the improvements or monitoring of products and process performance. They have a common vision, not only to supply the systems and instruments with first-class performance specifications, long term reliability and professional service support, but also, and in many cases more importantly, to maintain close contact to ensure that our systems provide all that our customers expect, and more, from their investment in our organisation.